Fail to prepare, prepare to fail – Roy Keane. 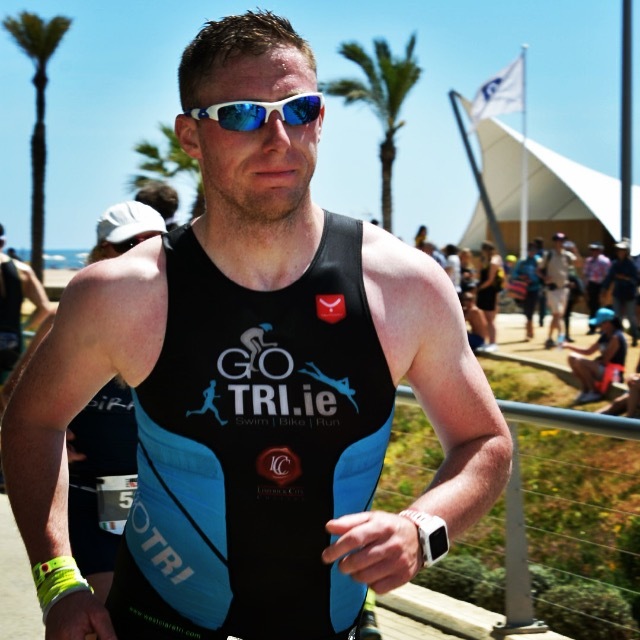 This is a race I entered while drinking on holiday in Lanzarote last year after seeing the guys walking around with the finishers jerseys for the 70.3 there, me like Andy in little Britain “I want that one” kinda also saw it as a bit of motivation to do something a bit different as I’d lost my way a bit and started to hate training because I just compare where I am now compared to where I was, a lot slower, this longer distance would help change things up. I generally do the bare minimum amount of training (enough to burn off all the shite I eat) with a rare burst of a mad training week so tipped along all winter doing a bit, even arranged with work to change my working week to fit in Wednesday mornings in lane 2 with Shannon masters, loved that, loved the visible improvement I was making with STL and Grainne chasing Liam, Andy, Ciara and Emma up and down the lane but unfortunately workload meant I couldn’t keep it up and also missed the track runs on Tuesday also. This meant I was left to my own devices which was a patchy training camp to say the least. If tagging people on memes on Facebook was training of have been well prepared. A couple of weeks out was dreading it, swore blind I’m selling EVERTHING after this. I was done. Even cleaned the golf clubs. I was having to go training rather than wanting to. everything was booked, ready and paid for. Hadn’t done the distance or done any climbing, I’d swam 3 times in 5 weeks and every time I ran I seemed to get slower. Luckily I got a bit done with greg and shane in the closing weeks which really helped ease the mind about the bike especially as the boys very positive about the whole thing. But no mistake about it, I was full on winging this thing. I turned up to my leaving cert hungover and still felt less prepared for this race that those exams. Week before it I changed my mind on bringing the TT bike I’d trained on all year to bring my mini Planet X road bike because it’s a lot lighter and I didn’t see the gains I’d make on the tricky descents on TT bike. Ment it needed an 11th hour massive mechanical over haul but all got done and shipped over no probs. My girlfriend Sarah was travelling with me so we hit of early to get 6 am flight to Barcelona from Dublin Thursday. Smooth sailing nothing to report. In fact everything was coola boola from flights, transfers, accommodation, food, registration everything was like clockwork for next 3 days, managed a couple runs, a cycle with west Clare lads and a swim with Greg and Shane, we let the WC TRI lads test the stormy waters where they got thrown around the place before we swam in calmer waters the following morning. Greg tried to bury his goggles in his forehead while attempting his patented swan dive entry and Shane fell into the Mediterranean. It went well. Was nervous a couple of nights before, legs were very heavy and my back and glutes tight, couldn’t really sleep, bearing in mind I was still winging this big time. It was weighing on me a bit, physically felt weight on my shoulders with nerves. The lads were a bit nervous too, shane hiding it well and Greg was walking his steak around calella in a doggy bag because of a loss of appetite. The Eve before we went down to bike check in, again really smooth, I still hadn’t forgotten anything, What’s goin on here? Race morning and I had brekkie with the WC TRI crowd in my hotel. The usual, all good. Went to check bike, racked beside Eugene Feely, he knew the club but I didn’t really know him all we had in common was we were both waiting to rob Pierre’s bike pump! Met all the boys to wish them a safe race. All good and done, down to race start, Kev Shaloo zipped me up, Diarmuid I taught, where your googles and hat?? ( old Diarmuid was back ) I’d tucked them in my wetsuit and had to chase down Kev to unwrap me to get them out! Job done. Swim start, a rolling start, a bit of rough n tumble but ok, felt slow, felt weak, felt all over the place, was taking in a lot of salt water but was finding a rhythm and managing away. Turned at far buoy and couldn’t see coming home due to a really low glaring sun but that was the same for everyone. Still felt slow but tipped away and out in 38 mins. Happy enough to be fair. Transition was long but grand no probs or panic considering it was my first time dealing with the transition bags. Out on the bike, this was going to test me, Doonbeg ain’t known for hills and didn’t have a compact crank and plenty climbing ahead. On the way outa town I was seized, glutes quads were both dead. “Diarmuid your in trouble here” I just wound back the gears and was trying to spin and stretch a bit, started to come around but wasn’t right. 3 k up the first climb I was all outa cogs… Oh lord what am I in for now. Dead legs and I had brought a knife to a gun fight… luckily I’d watched aload of videos on climbs tips, might sound stupid to the cyclists but this actually helped me a lot. Gave me something to think about other than my legs and the hills. Full pedal strokes, relaxed grip, rythem with plenty breathing, and a couple of hours later I’d 20k of the 32k climbing done and on to the tricky descent, here is where Greg “claims” he got a puncture but Shane saw him as he passed and reckoned he was grand :-). Was tricky coming down and got a scary skid but it was nice to have the home smell of the boys cutting hay in the fields beside us until that smell was replaced with the smell of my brakes killing my lovely zipps but before I knew I was down and had climbed the last climb and was on the road back into Calella. I had gave it everything, back was in agony but otherwise taught I’m not doing too bad here considering. Saw Sarah as I came out the tunnel roaring and picked me up a bit. 3:25 bike split. Was trying to do maths but roughly a 1:50 would put me close on breaking 6 hours, 45 mins quicker than I was aiming considering I hadn’t a lot done for it. Transition was smooth sailing and onto the run. My back was sore and stiff but said my only hope was to run it off and 600m I came to an aid station and realised I had no plan at all for these. What will I do? I decided I’d walk them all drown myself to stay cool in the now sweltering day and take on plenty water and coke, better to be looking at it that looking for it! WC TRI had loads of support there and it wasn’t long before I heard them! A former family to me but they were making noise for the lads in blue today! Again like swim and bike I just tipped away at it, nothing special and half way through 1:50 looked on. But I was starting to feel the effects of the heat and the far out part of the course was dead both of atmosphere and breeze to freshin things up. I started to see my pace drop but was still happy to be trotting along. Then I saw the lads Greg goin smooth and Shane was motoring along too, I could see he was in a bit of pain with his knee but that tough hoor I knew he’d battle it out, I stopped for 1 second to make sure he knew he was goin well and the tried to catch greg, then I heard him roaring behind me..? Houdini, I think he was gone off finishing that steak because iv no clue how I passed him on a straight road without seeing him. With that I’d 4k left and just had to hammer it out step by step and I did crossing the line in 6:04:48 no record but I was sorta happy with it considering my declining ability and training done and at the same time I was a bit emotional, more mad at myself than anything, Ya I’d done it but why hadn’t I trained properly for it? It felt a bit empty that I hadn’t worked for it like others had, I hadn’t earned it. I had winged it. It’s up there with my leaving cart in winging things. I got a beer, a bite to eat, a rub down and got back out to see Sarah where she told me she was tracking the lads all day and that they had just passed the 16k mark so I walked back to the finish to see them over the line, in truth they both looked stronger then than when I saw them a hour before. Only means the half distance didn’t suit them and they are more suited to the longer stuff 🙂 Greg came in a lil over 7 hours with his puncture which as the night went on was taking longer and longer to change and shane just a few mins later which was good considering all his travels for work and a recent knee injury. They were a very happy couple on the red carpet. All in all I was very happy, I had failed to prepare and I was prepared to fail but I got it done. I’d do it differently if I were to do it again and make more use of club sessions as I defiantly went backwards went I went lone wolf. 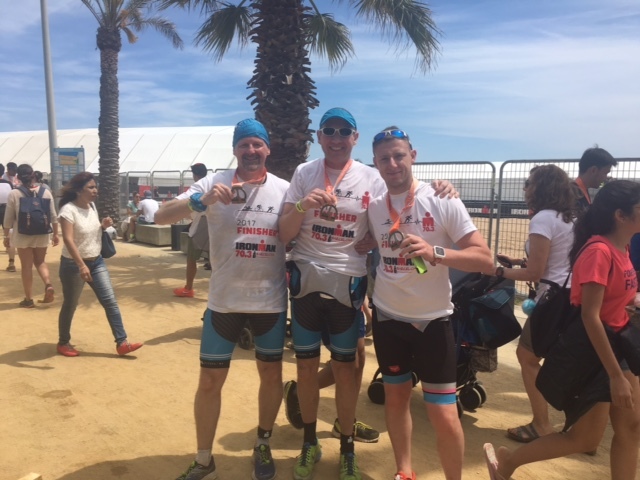 I taught it was a great event, Ya expensive but we wanted for nothing, locals were class on bike and run, weather was perfect and the craic with the two boys was priceless all week. Anyone going or thinking about doing their 1st 70.3, shouldn’t be worried, it’s a longer day but not as intense as a sprint or Olympic. Special thanks to Sarah for organising me and getting me ready, theres a reason things went fairly smooth and wasn’t down to me. See Ye at up the creek!